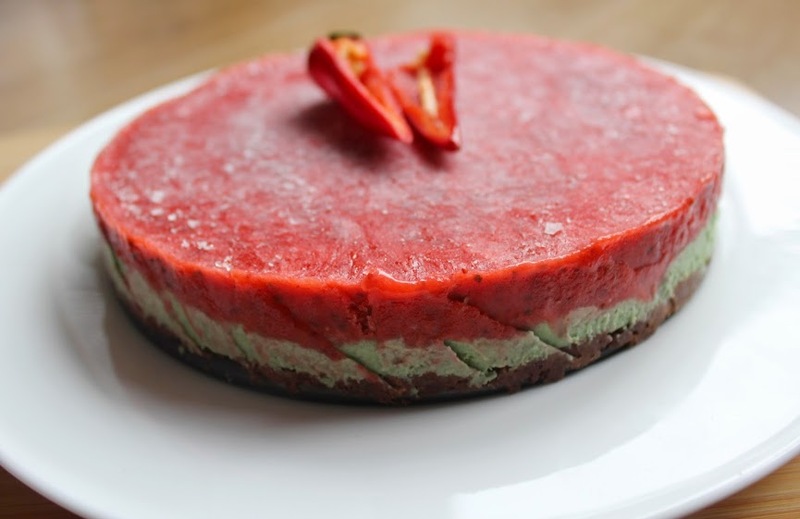 This raw dessert is a bit of a show-stopper and offers an amazing taste sensation, with its chocolate ‘biscuit’ base, creamy and tangy avocado and lime filling, topped with a tingy strawberry layer spiked with Tabasco Pepper Sauce. 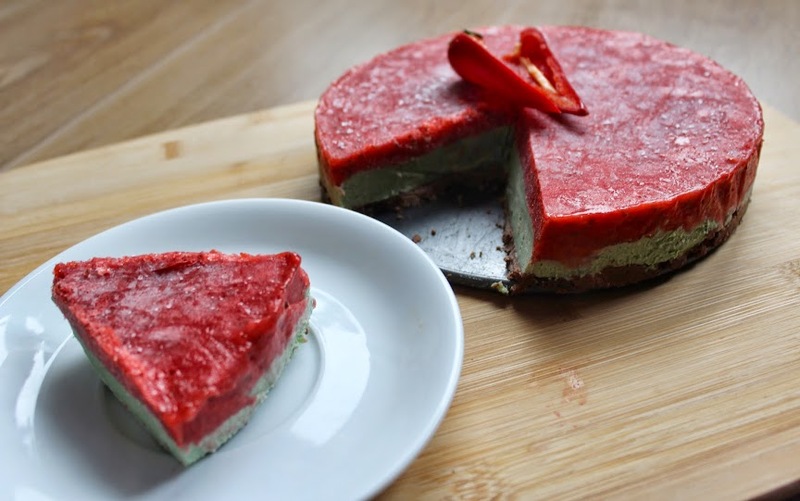 Full of healthy fats, no added sugar and some superfoods thrown in there, this guilt-free treat can be made well in advance and kept in the freezer until needed – all you need to do then is slice and serve! 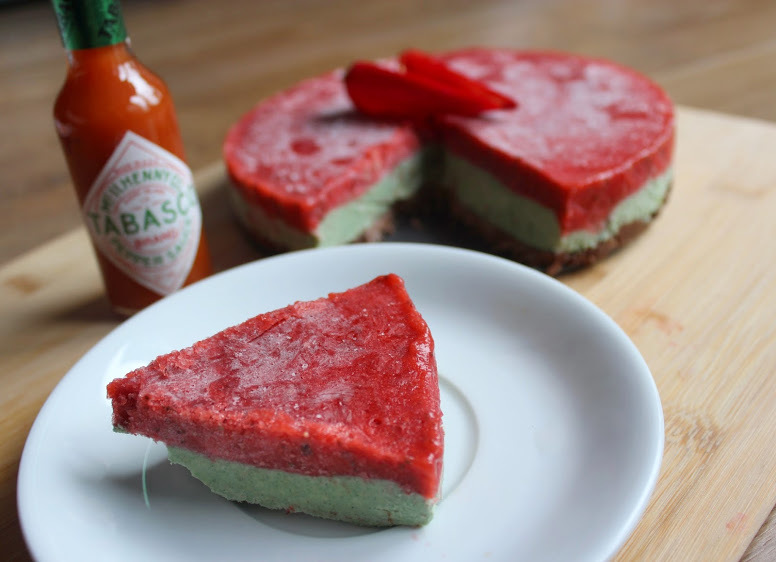 As part of Tabasco’s #FunWithFlavour challenge, look out for my other healthy but delicious Starter and Main dish too! Put the dry ingredients into a bowl. Stir the Sweet Freedom into melted coconut oil, then pour into the bowl, stirring well until the mixture comes together to form a soft dough. Transfer to a loose-bottomed cake tin and push it in evenly with your hands to cover the base. Place in the freezer while you make the filling. Drain the cashew nuts and add to a high power blender along with the remaining ingredients except the lime zest. 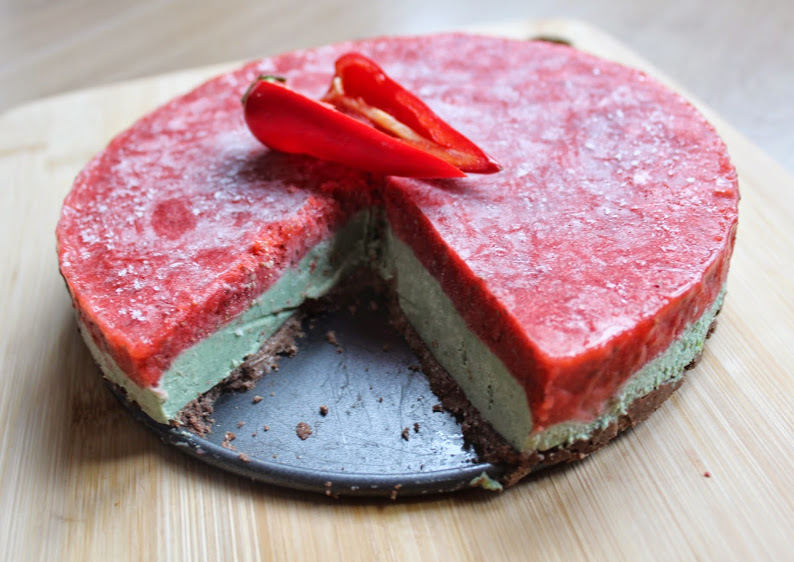 Blitz up until you have a thick, smooth consistency and beautiful vibrant green colour – this is what you want! 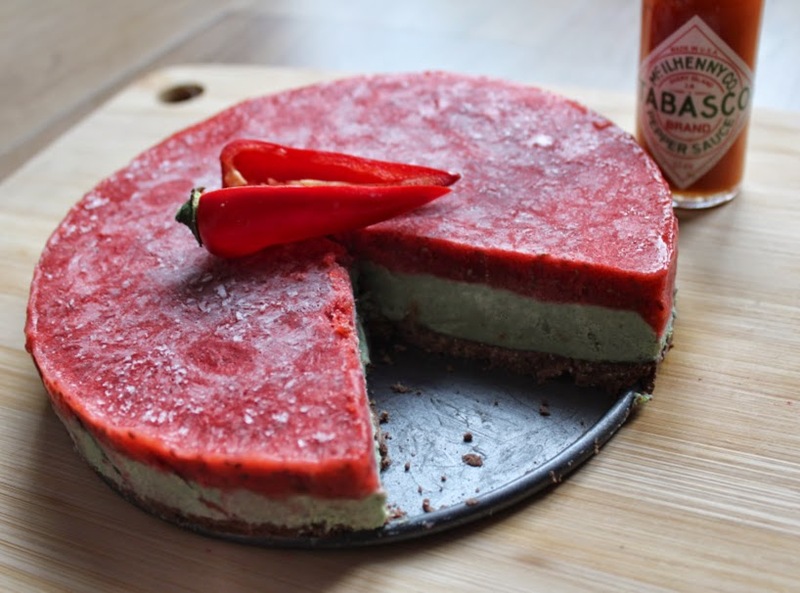 Remove base from the freezer, pour the mixture in, even out and return to freezer for at least 4 hours. Put the strawberries in a pan with a dash of water and add sweetener. Bring to the boil then simmer for 5-10 minutes, until the strawberries have softened – make sure there is enough liquid at the bottom so they don’t burn! 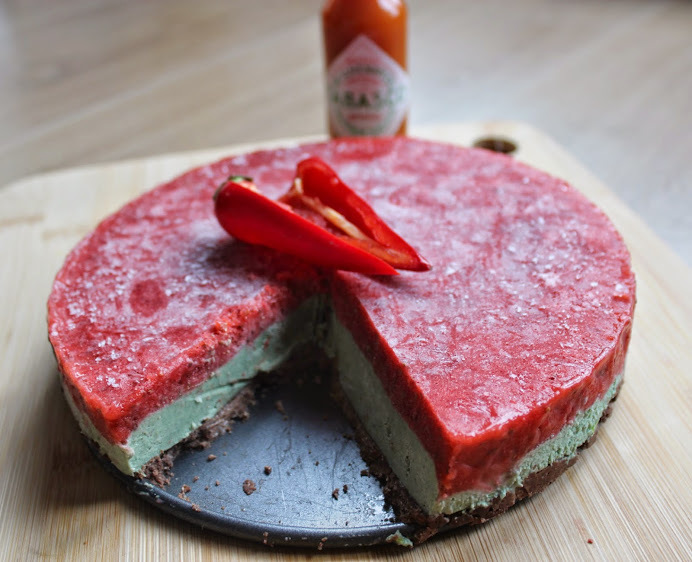 Leave to cool, then add to a blender along with the lime juice and Tabasco. Blitz up, stir in the chia seeds, leave for 10 minutes to thicken slightly then pour over your avocado layer. Return to the freezer for at least 4 hours. Ready to serve? 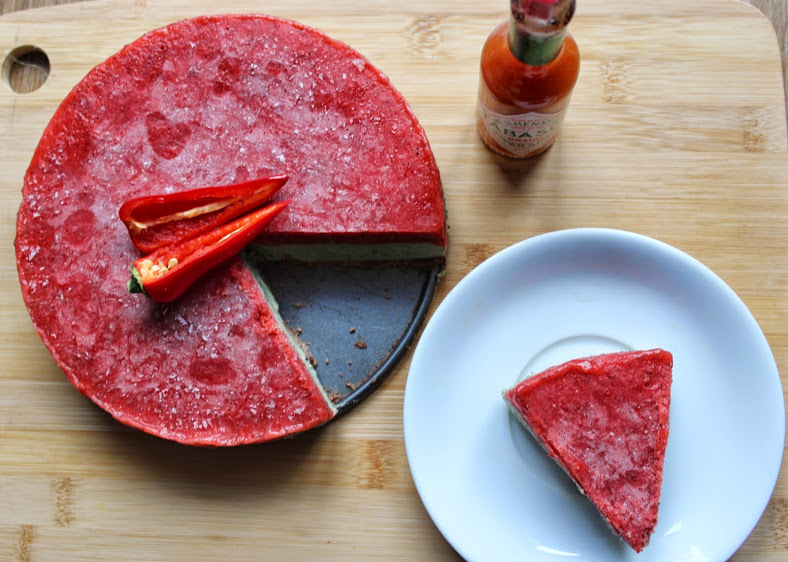 Remove the cheesecake from the freezer 10-15 minutes before. You can either serve now or leave in the fridge for an hour. Slice up and enjoy!